True Hope and a Future: Why didn't you tell me I was happy? Why didn't you tell me I was happy? I don't remember there being a time growing up when the TV wasn't on. While I've cut back considerably, I do like watching a good show on those occasions when I want to "check out" for a while. One of my favorite shows is Monk. Maybe it's because I've liked detective stories since those childhood Saturdays curled up in my bedroom with a volume of Nancy Drew, or maybe it's because I could very easily be Monk; I definitely share his love for details, order and routine. 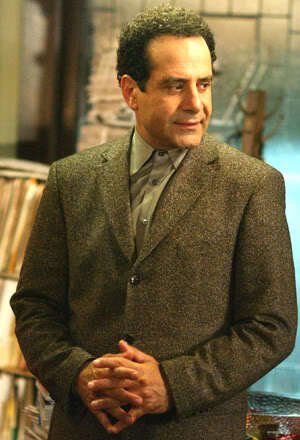 Adrian Monk worked as a detective with the San Francisco Police Force until he suffered a breakdown following the murder of his wife, Trudy. For the last eight seasons, obsessive-compulsive Monk has been recovering from his trauma, overcoming his fears, and working with the force as a consultant. His greatest desire, next to finding Trudy's killer, was to have his badge returned and be reinstated to the police force. This desire became reality in this week's episode. While initially happy to be back on the force, Monk found himself encumbered by all the rules and regulations he now had to follow. While discussing his frustration with his long-time assistant Natalie, he realizes receiving his badge back did not make him happy. In fact, it was just the opposite. Monk said, "I was happy before! Why didn't you tell me I was happy?" Isn't that just like us? We decide what we want and chase after it, only to learn we were actually better off before. Then, rather than taking responsibility for our own actions, we look around for someone else to blame. Why is it that we, with our limited understanding, think we have to figure things out for ourselves? Why do we think we're capable of figuring things out for ourselves? Can Good Come Out of Bad?